Originally posted on War Poetry – the blog of Tim Kendall, Professor of English. 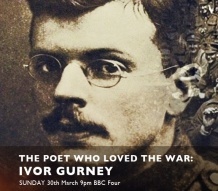 My documentary on Ivor Gurney, directed by Clive Flowers, will be broadcast this Sunday, 30 March, at 9pm on BBC4. Several years ago, a number of scholars specialising in the First World War were invited to a jointly-organised AHRC/BBC event in London. We discussed our work, and gave our views on how the BBC might mark the forthcoming centenary. There I met an executive producer, Mike Poole, who, as luck would have it, had always wanted to commission a programme about Gurney. So he approached Clive, making him the gift of a rather startled academic with no previous TV experience as presenter. The filming process, although exhausting, was an absolute joy. Locations included the Somme (where Gurney was shot), Passchendaele (gassed), the Royal College of Music, and some of the hills around Gloucester which inspired Gurney’s greatest poetry. Thanks to Ryan‘s stunning camerawork, it is easy to appreciate why Gurney loved these landscapes. We were also lucky to interview such eloquent experts, my biggest regret being that, for an hour-long documentary, so much superb material ended up on the cutting-room floor. Lost in the no-place of the asylum for the last 15 years of his life, Gurney complained constantly that he had not received the ‘honour’ that was due to him. Wishing for death, he felt forgotten, betrayed, exiled from his native Gloucestershire and condemned to lingering torture. I thought about that a great deal as I was helping to make this documentary. The programme is intended as some small and belated recompense, a homage to an extraordinary genius who remains underappreciated even today.